The "lie detector" test that takes place as part of the employment background investigation is understandably a significant source of anxiety for many aspiring police officers, FBI agents, and other criminal justice career hopefuls. Fortunately, the polygraph doesn't have to be a stressful experience. Understanding what it is and knowing what to expect can help you feel better about your prospects of passing and help get you one step closer to the perfect criminal justice job. Polygraph devices have been around in some shape or form since 1895. The first one only registered blood pressure. William Moulton Marston is credited with being the "father of the polygraph" for his 1917 publication detailing the detector that he'd created two years earlier. Then came John Larson—a police officer and medical student in Berkley, California—with his own invention in 1921. The lie detector has been in use now for almost 125 years in various settings. Larson believed that people experience slight, involuntary physiological changes when they lie. He believed he could catch the lie if he could detect and record those changes. The polygraph instrument measures multiple vital signs to indicate whether someone is being deceptive. The polygraph examiner looks for changes in blood pressure, heart rate, respiration, perspiration, and skin conductivity. These are sometimes recorded as ink lines on a paper roll, with peaks and valleys denoting differences in physiological impulses detected by the machine, although computer images are far more common in this day and age. The pre-employment examination typically starts with a pre-exam questionnaire. The questionnaire is similar to the supplemental application that most agencies require candidates to complete prior to screening. The pre-exam is often much more in-depth, however. The questions are broken up into sections in a booklet, and the applicant provides written answers. It generally takes a new candidate up to two hours to complete the entire booklet. It might take prior law enforcement, corrections officers, and military personnel even longer because they're dealing with more relevant questions about their past employment. Applicants can expect to answer questions about past drug use, criminal behavior, and employment history. They might be asked to disclose information about the frequency and quantity of their use of alcohol, as well as other issues that, while not illegal, could indicate personality traits or habits that are less than desirable in police employment. The actual polygraph exam will begin after the applicant completes the questionnaire. She'll wear a blood pressure cuff and other devices that are connected to the testing instrument. The examiner will get a baseline reading of vital signs. The examiner will then ask a series of yes or no questions that are already known to be true. For example, if the applicant's name is Robert, the examiner would ask, "Is your name Robert?" and Robert would answer yes. Then the applicant will be instructed to lie purposefully. This lets the examiner establish a record with which he can compare the results of the actual test. There's no need for those who have a nervous disposition or a guilty conscience to fear the test. The purpose of the initial control questions is to establish your normal range. The test looks for changes in physiology, so your overall demeanor won't have any bearing on the exam. Instead, how you feel about each individual question will register as either a truthful, deceptive, or inconclusive response. After establishing the baseline and control questions, the actual exam begins. Surprisingly, this usually takes the least amount of time. The applicant will again be asked a series of yes-or-no questions based on the answers she gave in the pre-exam questionnaire. Common question topics include theft, drug trafficking, dealing or usage, and alcohol use. You might be presented with questions about arrests or commission of any crimes, domestic violence incidents, or contacts with organized crime. And, of course, you can expect questions regarding your general background and the information you've already provided. The purpose of the employment polygraph test is basically to determine whether a candidate has been truthful on her job application. Any indication of deception can be cause for disqualification from consideration for employment. Answers from the pre-exam questionnaire might also indicate background disqualifiers, especially if they show previously undetected serious crimes or if the answers are different from those given on the supplemental application. 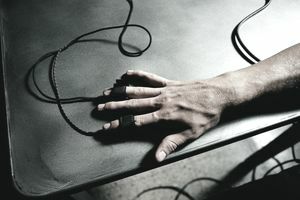 Do Polygraph Exams Really Work? A lot of skepticism surrounds the validity of polygraphs, but the fact remains that they're an effective tool in screening applicants for criminal justice jobs. Regardless of whether the instrument can reliably detect deception, the tactic can often elicit truthful responses from people who might otherwise be inclined to lie during their background investigations. Most people will tell the truth more often than not when they believe there's a better-than-average chance of being found out. Can You "Beat" the Polygraph Exam? Perhaps the better question is, should you try to beat the polygraph if you're applying for a career in criminal justice. Remember, law enforcement professionals necessarily hold positions of great trust in their communities. The principle of the test requires that the subject knows she's lying, and that she cares about being deceptive. There are members of the population for whom lying has no bearing on their conscience and they'll therefore be less likely to show the types of physiological responses the instrument is designed to measure. That said, you're usually better off keeping your responses to simple yes or no answers. Don't launch off into explanations, and don't try to go back to change an answer after you've given it. Some minor past indiscretions can be and often are forgiven. People aren't perfect. Absent any flagrant missteps in your past, you're being judged more on your honesty than on actions you might have taken.